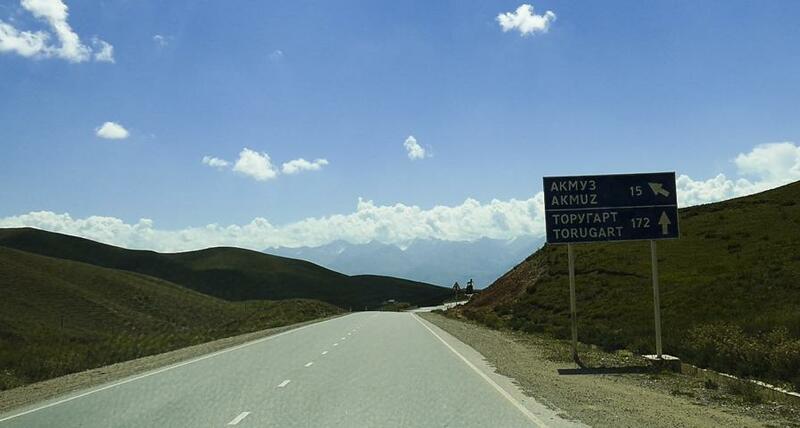 Crossing the border from Kyrgyzstan to China’s Xinjiang Province on the way to Tibet. 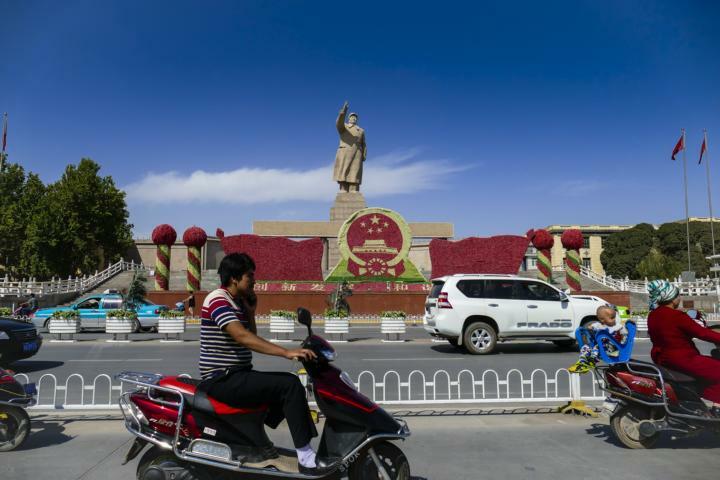 Quite some time waiting for things to be done, roads to open for traffic and a guide in Kashgar very much at his limit to be acceptable – probably it’s just the usual when crossing Tibet from west to east. After our short get-clean-everything-and-everybody-stay in Naryn to recover from nomadic life we drive on to Tash Rabat. 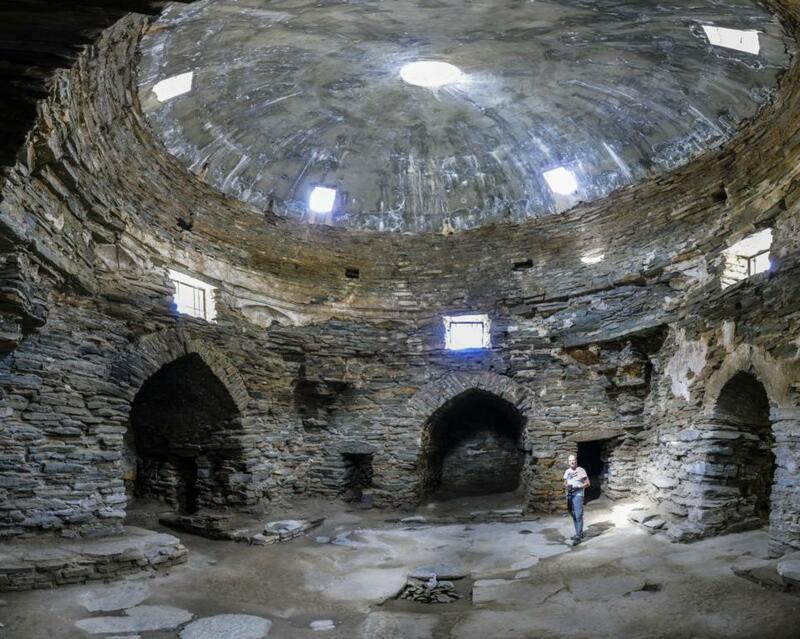 This place only a few km from the Torugart Pass at the Chinese border has 1 of the most important caravanserais of the old Silk Road. A paved road towards the border. 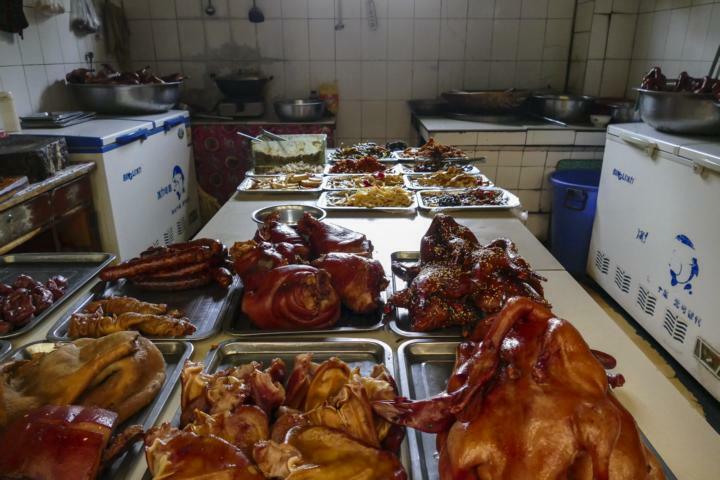 Some Chinese trucks probably filled with all kind of plastic ware. On the way some signs of the past power struggle between the good old Soviets’n’Chinese. Nowadays rather a children’s playground or a decaying memorial site. Another Yurt Camp: Sabirbek’s. Rather nice, super location and even a sauna. Time to visit the caravanserai. Imagining how in the old days the silky traders were sneaking over the snow covered passes to reach this shelter on their way to Constantinople. Imagining how they arrive in harsh wintertime with their camels frozen to a piece of meat in the evening. Finding a comfortable and well heated shelter from the ice storm. The warm welcome of the Kyrgyz sommelier with some bottles of vodka – and imagining their hangover the next day. Well, the 2nd day in Tash Rabat we use purely for admin. issues. Somebody tells us that we would definitely have a huge risk to be refused to enter the border area to China without a special permit. Thus, our trip to Tibet could be in danger. As this permit is easily available in Naryn, we simply have to drive back, pick it up and come back. 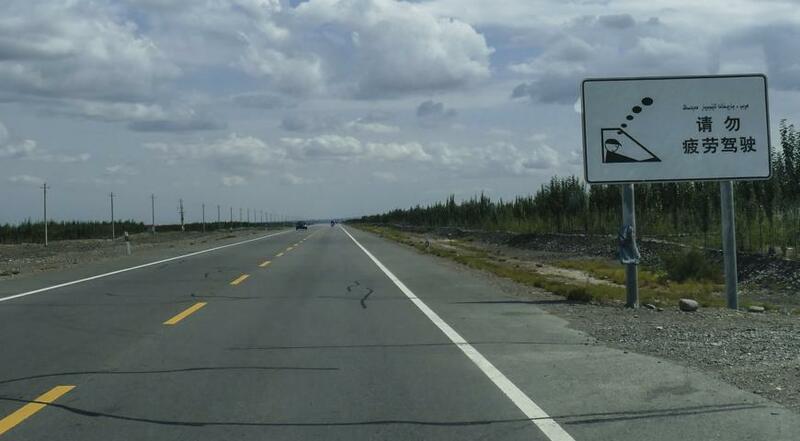 Once in Naryn they tell us that definitely no permit is needed with our own car and a Chinese visa. So we drive back to Tash Rabat. Happy that the trip has not been longer than 250km. Our reward: a nice and hot sauna. And at least this evening is less cold’n’rainy than the day before. … a little disappointing landscape along Chatyr Lake. At 10am we’re at the border. Quite a story follows. It’s mostly about waiting for an unpredictable guide. Anyway, at 10pm we finally arrive at the hotel in Kashgar. The next morning a visit to the nearby public place. Lots of people. Not just walking or sitting on benches or discussing to solve all problems of the world. No, they’re on real hard exercise: all kind of yoga, dancing or if slightly older supervising the whole thing. A stroll thru the town’s busy streets. Searching for interesting products made in China. 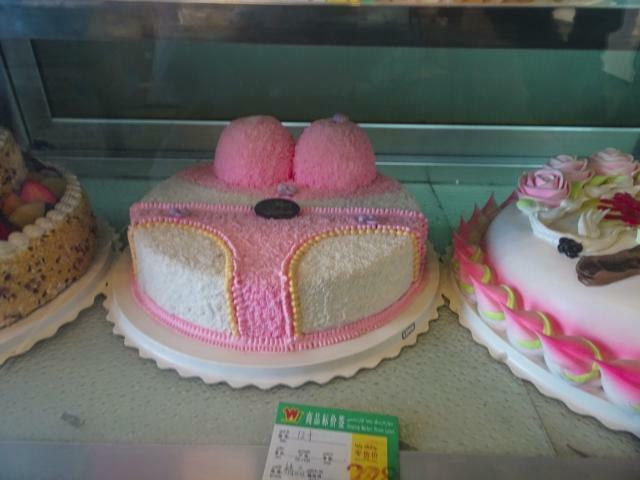 The most creative 1 we discover in a sweets shop. Sorry ladies, we just took the pic. Then to Kashgar’s famous old town. Not much left. Most is replaced by beautiful high rising buildings. Nevertheless, a few roads are still lined by some century old mud or brick houses, traditional shops and eateries. 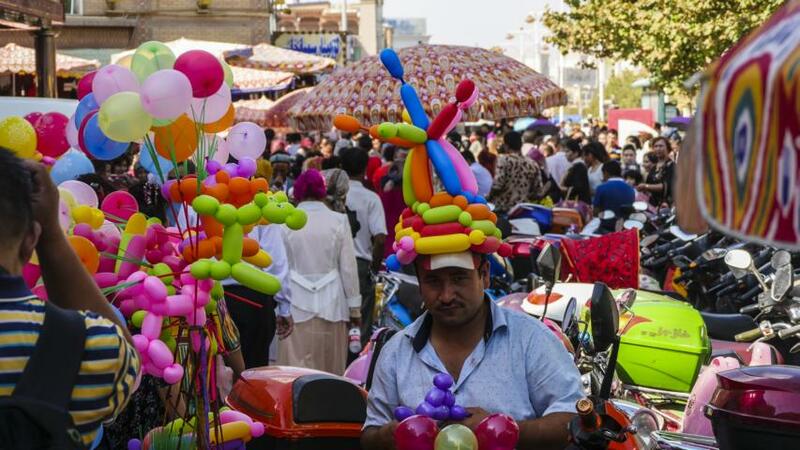 … but also the very lively Sunday animal market. As we’re at the eve of Eid al-Adha,priority is given to all kind of sheep. Of course animals are not all Kashgies live from. Therefore, a visit to the general market. 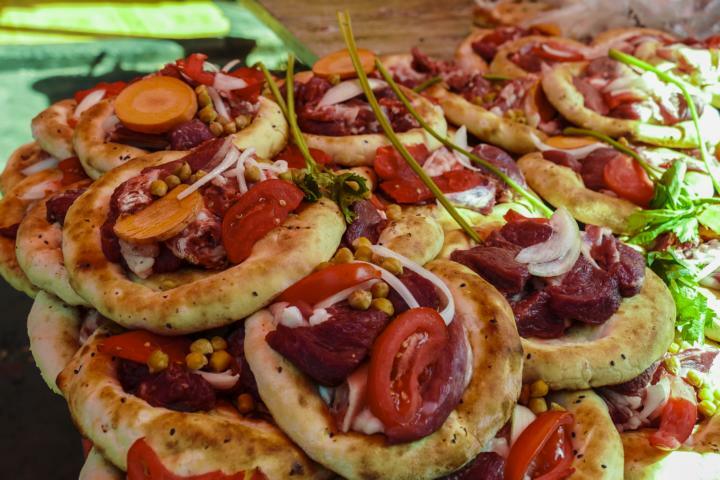 We find wonderful Chinese pizza – just waiting for a customer before getting steamed (not baked). Astonished we also discover a section with some animals. By now dried. Everybody in Southern Africa would recognize them as Biltong, others maybe as delicious Jerky. 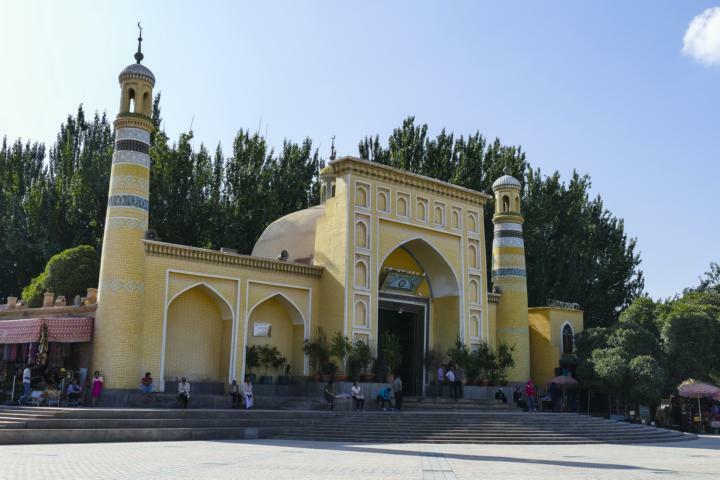 … to get to the great mosque – the tallest in China. On Monday 12th September in the afternoon all our documents are ready. Nothing may stop or discourage us any more to enter and cross Tibet. We take the highway to Kargilik and 3h later we arrive. On the way some interesting road signs. We’re still not sure on how to interpret it. Probably it just says if sleeping while driving you have to snore. Whatever. In Kargilik Thubten, our guide for Tibet, awaits us. Then a short stroll thru this rather nondescript town and that’s it. Not much to see; but some interesting offers. The next morning we’re ready to move on. To the Tibetan Plateau. Well, Kargilik is the place where we abandon the Silk Road. While the silky traders sneaked eastwards thru the Taklamakan Desert, we head to the south to the Tibetan plateau. Heading to a cultural environment completely different and following the highest road in the world along the Roof of the World. Sorry guys in Lesotho – we discovered another roof. Maybe an opportunity to start discussions about numbering all these roofs. 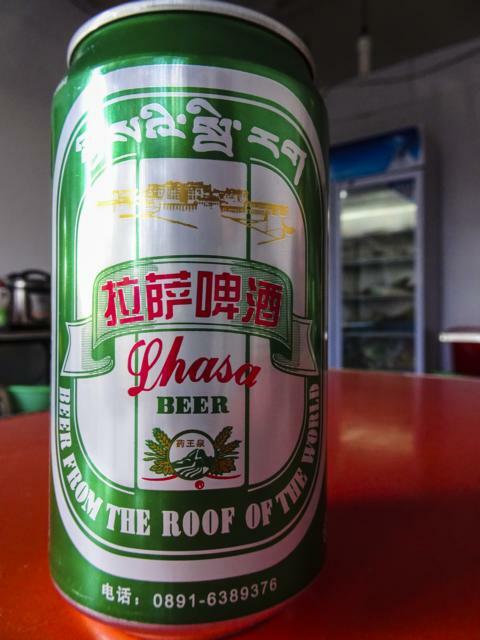 As you can state the locals here are that sure about their roof they even print it on their beer can. And that must be an ultimate proof. But 1st we quickly have to register with the police. It takes some time. Nobody in the office, probably everybody still tired of Eid al-Adha. 1h later Thubten found everybody. Unfortunately, they don’t approve the planned trip because of some military manoeuvres along the road. No problem. A call to Lhasa, getting the boss of all bosses involved, having a lively exchange of faxes and finally 6h later we may start. By now in possession of the most special permit anybody may have, allowing us to pass. But without taking pics. By 5pm we’re ready to start. Ready for the highest road in the world leading from Kargilik to Lhasa. Today just 250km up the mountains. Some 70km further, by 6pm we just have to get some fuel before ascending the 1st pass. A long queue at the petrol station. And a small technical problem. The identification system registering each and every customer before diesel can be bought is out of order. 2h later still no diesel. It’s getting dark and still 2 high passes to cross. Principally we have enough fuel up to the next place – so we move on. Hoping we’ll really find some diesel further up. By the time we arrive at the 1st pass it starts raining and it’s getting even darker. Probably a beautiful landscape, high up to 4995m. 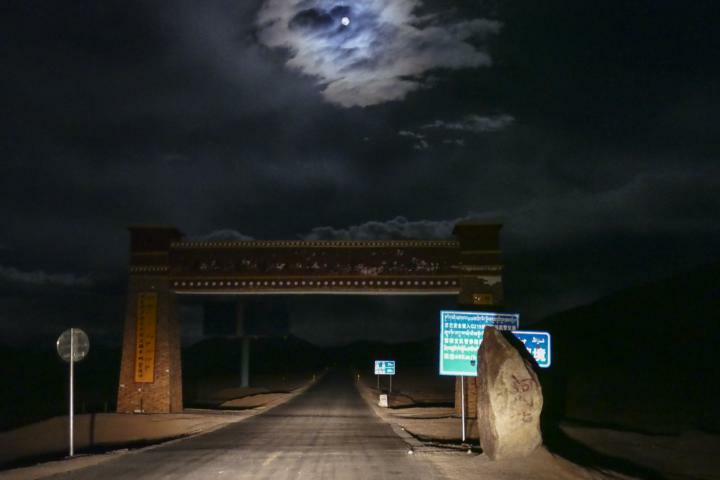 A new record for Prado – some 100m higher than the highest pass in Tajikistan. … and some beautifully spicy instant noodles for an early breakfast. 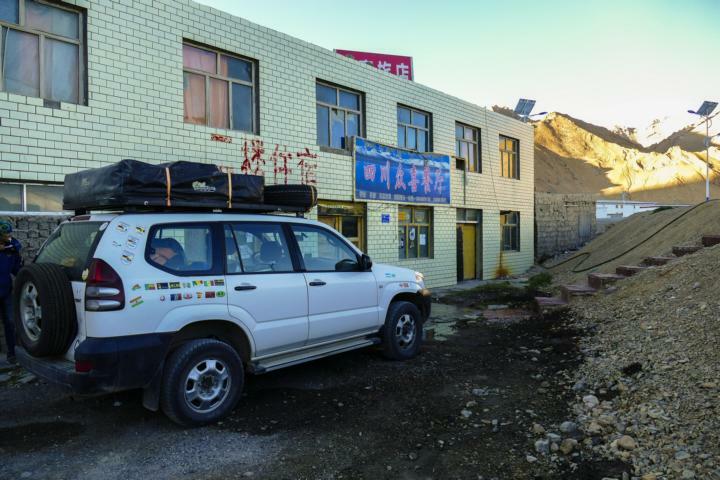 8am, at dawn we start for today’s destination: Duoma – the 1st village in Tibet. Some 600km and 10h of driving away. … and a short time later we arrive at the 1st check point. We move on. Still a long way to drive today. Some 40km later, at 11am we’re stopped. Military manoeuvres ahead. We just have to wait until 6pm; then we may continue our next 400km to reach Duoma. No choice – we drive back to the next settlement and wait. We wait more and then still a little more. By 6pm the road opens again. Just 400km left. We cross a 5300m high pass. Beautiful landscape. Sorry still no photo. 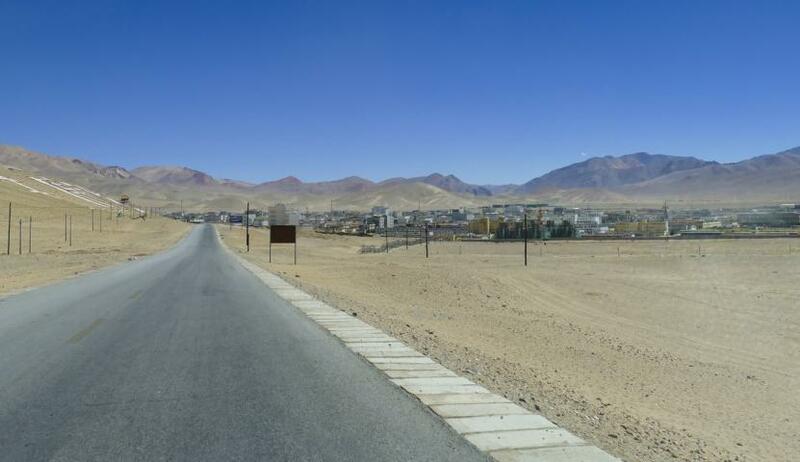 We drive on a high plateau of just over 5000m. By 10pm we are at the border to Tibet. Then the highest pass at 5340m. In the meantime Prado is so used to high altitude it even doesn’t show any gasping. By 2am we arrive in Duoma. A guesthouse by the roadside. This time a proper double room with a toilet à la nature anywhere in the village. Next morning: no more instant noodle soup for breakfast. A look at our stock and we have coffee and bread with real Russian butter and German quince jelly. 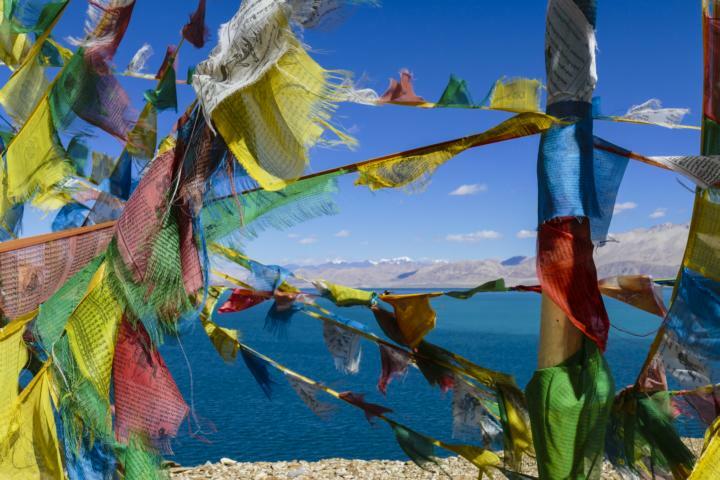 We move on to Ali – the capital of West Tibet. Some 250 km on good roads. No more real danger of being stopped due to anything. 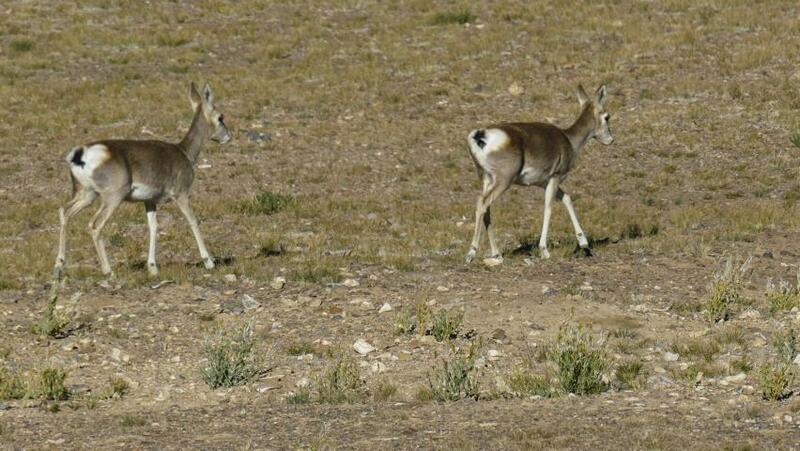 On the way some Tibetan deer – look like South African Springbok. … reaching Lake Bangong. The very same lake we visited some 9 years ago from its Indian side – Lake Tsomoriri. 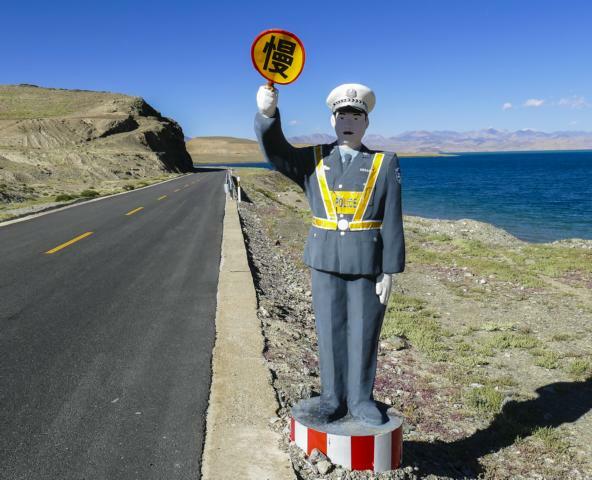 On the way along the lake some more interesting Chinese road signs: a kind of fake policemen remembering drivers not to speed. 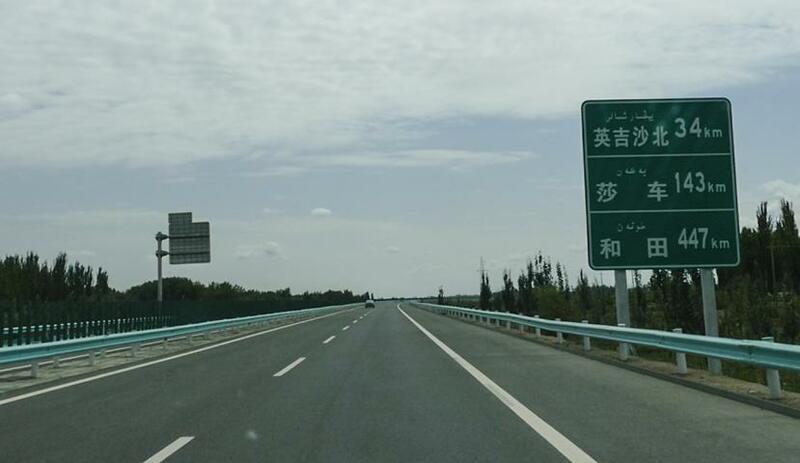 And finally we approach Ali – the proud capital of West Tibet. The place we want to send Prado to the Tibetan car doctor to make a diagnostic about this strange noise in 1 of its wheels. More about this and other adventures in the next post.